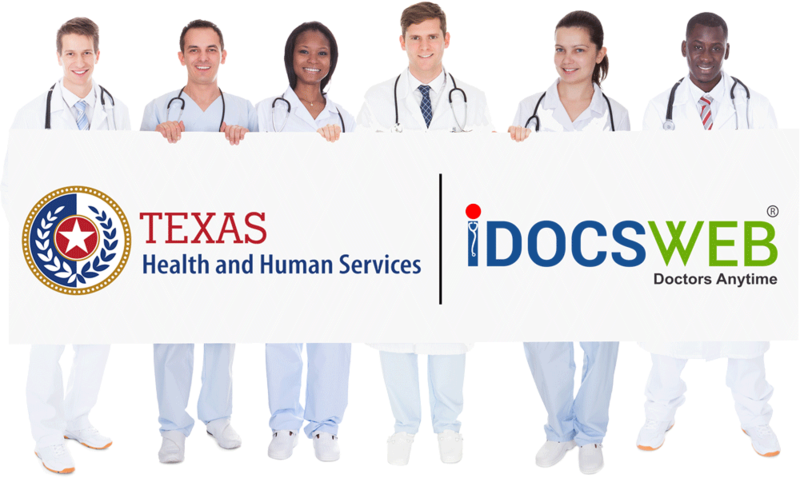 Did you know you can use iDocsWeb telemedicine to meet your additional staffing requirements? 1. Hours above the federally mandated eight hours of in-person RN coverage must be scheduled non-concurrently with mandated hours. 2. NFs must provide in total 12 or 16 hours of RN coverage, respectively, on at least 90 percent of the days within the reporting period. 3. NFs may use telemedicine / telehealth services for scheduling hours beyond the eight-hour in-person mandate. Data will be collected monthly through a Web portal developed by HHSC. Facilities will have three business days into the following month to complete their submission for the reporting period (the previous calendar month). Facilities must attest to the number of days the additional RN staffing hours were met and how services were rendered (in-person or via telehealth). For telemedicine / telehealth services, facilities must report total hours covered and any encounters that do not meet an in-person level of care. Telehealth services will be considered unavailable during any encounter that does not meet the in-person level of care. Any hours wherein telehealth services are unavailable for any reason will not count towards RN metric hours whether or not services were requested during that time. Good news, iDocsWeb telemedicine was designed specifically for Long Term Care / Skilled Nursing Facilities. Our platform meets and exceeds the QIPP Texas Telemedicine qualifying requirements! For purposes of the QIPP, when health care services are delivered by a provider to a resident at a different physical location than the provider using telecommunications or information technology, such services are considered to be telehealth services. In accordance with 1 TAC Chapter 353, Subchapter O, §353.1304(g)(2), telehealth services may be provided only by an RN, APRN, NP, PA, or physician. To be considered appropriate and sufficient, telehealth services must be provided in compliance with all standards established by the respective licensing or certifying board of the provider. The requirements for telehealth services in acute care settings do not apply to the use of telehealth services in the QIPP context. The provider must obtain informed consent to treat from the resident, resident’s parent, or the resident’s legal guardian prior to rendering services via telehealth. Healthcare providers at the resident’s physical location cannot give consent on behalf of the resident. with a synchronous audio or video interaction between the provider and the resident. Other forms of audiovisual telecommunication technologies that allow the provider to meet the in-person visit standard of care. If the time that elapses between facility staff recognizing a need for RN-level care and initiating a telehealth service request exceeds 15 minutes, the encounter does not meet the in-person standard of care. Furthermore, if the time that elapses between a completed request for telehealth services and the engagement of the telehealth professional in a resident consultation exceeds 15 minutes, the encounter does not meet the in-person standard of care. 1. How many days during the reporting period (the previous calendar month) did the facility meet 4 hours of additional RN coverage? 2. How many days during the reporting period (the previous calendar month) did the facility meet 8 hours of additional RN coverage? 3. By checking this box, I attest that additional RN hours used to meet these metrics were not concurrent with otherwise mandated RN hours. The first two items are tied directly to meeting the first two quality metrics for Component Two. 4. Did the facility use telemedicine / telehealth services for any of these shifts? 5. How many days during the reporting period did the facility use telehealth services to meet the additional RN coverage hours? 6. How many hours during the reporting period did the facility use telehealth services to meet the additional RN coverage hours? Page 2 includes open text fields and date markers for the facility to upload or enter encounter summaries for all telemedicine / telehealth service encounters. iDocsWeb includes powerful reporting and data analytics features making encounter reporting effective and easy. To learn more about our reporting and analytics features, please visit the Documents & Billing Section of our site. iDocsWeb Telemedicine allows NF’s to meet the QIPP Texas Telemedicine requirements which means you can use remote assistance to achieve your QIPP requirements. That equates to less money spent and more money collected! Still have questions? Don’t worry, we’re here to help. Contact our QIPP Expert to learn more about using telemedicine to achieve your QIPP goals!